Those are wooden giant chess which sized in 36 inch. Usually use for outdoor game at garden, camp, and others interesting area. The playing surface for this chess set is a chessboard with 18" x 18" squares, and is highly suited to being played by adults in various outdoor settings, and for many different occasions. Although the pieces are quite heavy, and are not easily transportable, they can be easily shifted across the squares of the board in actual play. We are manufacturer of giant chess pieces in various sizes. You may choose your favorite chess pieces and order to us. 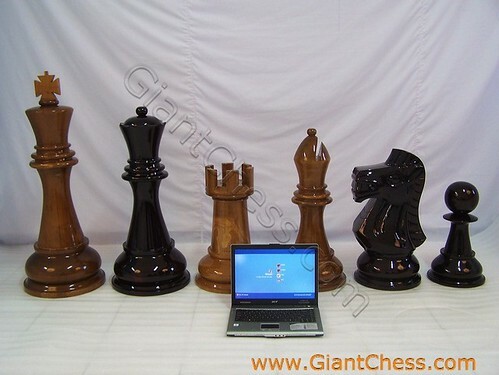 We also serve in big chess, chess set, standard chess, 12 inch chess, chess board, chess table, and other chess product. All of our product are made of Teak wood in high quality. Those are carved by our expert craftsman from Java island. You can see our product in many famous hotel and resort in western countries and Europe.